Two snails were standing on the side of the road, a turtle stopped and said, "Do you guys want a ride on my back"? One of the snails took him up on his offer and off he went. As the turtle reached the intersection another turtle came along and crashed into him. The poor little snail was thrown and killed. 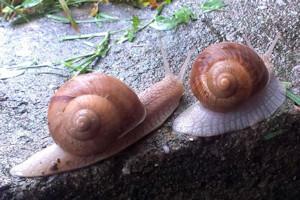 A cop investigating the accident began questioning the dead snail's buddy. "What happened?" he asked. The little snail replied, "I don't know it all happened so fast."